Retail Florist: These are the street shops you see where you can stop for a bouquet of roses. They are wonderful resources for small orders and items but are not always equipped for or accustomed to servicing full events. Sometimes these shops will do funeral display pieces, but more often than not they are not who you want to use for your wedding. Floral Designer: This is your standard wedding florist. The one who specializes in creatively combining beautiful flowers into bouquets, boutonnieres, centerpieces, and decor items for your event. They are generally creative/artistic people who are able to customize their style to the event they are working on (or at least, they should be, but more on that in a minute). When you work with a floral designer you are paying for their flowers, their services, and their creative artistry. Full-Service Event/Floral Designer: There can be some crossover between this and the option above. When you work with a full-service designer like this, you are looking at the option to get not only your flowers, but candles, table numbers, paper goods, and any other decor pieces you might want. These super talented artists are usually most helpful if you have design ideas about your event, but need help executing, and would rather work with one person on all of it. Figure out if flowers are a priority: Depending on the length of your engagement, when you’re getting married, and how important flowers are to you, you may want to start looking at florists pretty early in the process. Many florists are one-man/woman shops who are only able to do one wedding per day or weekend, and they can book up quickly (especially if you’re getting married during high wedding season). Ballpark your budget: As hard as it may be at this stage in planning, it’s also helpful to have some general idea of the budget you are working with for floral design. (Have no idea what that might be? Check out my article here on wedding budgets.) If you start reaching out to florists without a budget in mind, you could end up with quotes that range from $1,500–$15,000 (which is not so helpful). Identify your style: Before you get in touch with anyone, it’s helpful if you have an idea about the types of flowers and floral design you like. Look around Pinterest and real weddings to start getting a feel for the styles and types of flowers you prefer, but don’t overthink this part too much. A lot of what you’ll end up with will depend on what’s in season and what your budget can accommodate (because it’s totally possible that the bouquet that looks like you could make it yourself actually cost $400). In reality, most of these styles have a lot of overlap (maybe you want a wild bouquet with romantic colors, or a classic bouquet with a natural vibe), so don’t worry about figuring out the exact term for what you want. Instead, use these ideas as a guide when doing your research and communicating with your florist. Now that you have a style in mind and a budget in hand, you’re ready to start researching florists. Here are the steps I recommend following while you’re on the hunt. 1. While Google is good for many wedding-related things, flowers are generally not one of them. Google is programmed to give you the most popular search results, which in the floral industry usually means national chains and their affiliates. So if you want a local florist, the best place to start is by asking friends and family who may have gotten married recently (especially if you were at their wedding and loved their flowers). 2. Use wedding websites to help you hunt for vendors that are trusted and reviewed. The APW Vendor Guide, Here Comes the Guide, and Wedding Wire are good places to start. Pro tip: If you find flowers on Pinterest that you really love, click through to the original post where they were published. Wedding blogs usually include vendor information at the bottom of all real weddings and styled shoots, and usually list the name of the city in the post, so it’s not hard to figure out if the vendors are local to you. Then, if possible, cross-check against the review sites to see feedback from actual customers. 3. Once you’ve narrowed it down, take a look at the websites and portfolios of the florists you find. You should be able to tell pretty quickly if they have work you like. 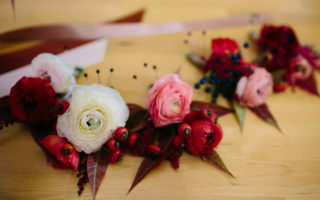 Keep in mind: While most reputable florists should be able to accommodate a variety of styles, some designers specialize in just one. So keep an eye out for variety. For example, if you’re looking for more modern flowers and notice that one of the florists you’re considering has a portfolio full of loose, whimsical, natural-looking arrangements, and nothing else, you might want to consider looking elsewhere. 4. Check for pricing. Many florists work on such a customized basis that they don’t have pricing listed on their site. Some, however, will list a minimum that can help you determine right away if they can work with your budget. Worth noting: Those minimums are usually for full wedding flowers (bouquets, centerpieces, other arrangements, etc). So if you’re just looking to get what I call “personals” (aka bouquets and/or boutonnieres), then the minimum may not apply. In that case, it’s best to reach out and ask. What’s their design process? Will you do a joint Pinterest board? A design brief? Do you just tell them what you like and let them do their thing? If you’re doing centerpieces, do they have containers you can rent? Will you need to provide your own? Do they help with setup, or will you need to arrange pickup from a studio? Is there a delivery fee? If they provide containers for your flowers, will they come pick them up after the wedding or will you need to return them yourself? What do they do if they can’t provide something you’ve agreed upon (e.g., if there’s a ranunculus shortage the week of your wedding, what’s the protocol?)? Do they recommend doing a trial? Will it cost extra? Have other questions about hiring a florist? Leave them in the comments! Alyssa is the owner and lead event planner for Rose Gold Events in the San Francisco Bay Area. She’s been rocking the wedding industry for the last four years after becoming a Certified Wedding Planner in 2011. In her free time, you’ll find her traveling, reading, and training CrossFit. Alyssa loves love, macaroons, logistics, and a good party dress. And she still cries at every wedding.